Every girl fits in at Waukeela because every girl is accepted as they are! 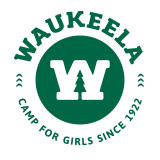 By fostering a safe environment, leadership opportunities and a community of sisters who place no judgement on each other, Waukeela girls are able to build each other up and blossom into their best selves! At Waukeela our campers have the opportunity to try (and fail) in a safe environment. In an environment where we don’t keep score of each failure, but a place where our campers can try and try again. The growth experience at Waukeela is one of a kind! Our campers return home more confident in themselves and carry that over into their everyday lives. Every summer, our campers gain more and more confidence! Whether it’s being a Big Sister or leading a hiking trip, our amazing staff and counselors cultivate an encouraging and supportive environment during age appropriate opportunities that allows our girls to grow and build each other up. In addition to the support she receives from her counselors, cabin mates and assigned big sister, Waukeela campers make friends all over camp in their favorite activities, their bunks, and dancing in the dining hall. The friends gained at Waukeela are the best because they’re not worried about who has the most fashionable outfit on or who’s dating the cutest guy in school – they’re only there to build each other up!